Most of the reason the foreigners reckon that food in the UK is rubbish is because when they come and visit they stay in London. This city’s plethora of overpriced (fast food) crap in the centre is enough to put most people on a self-imposed holiday diet! But for Syrah week I’ve got the opportunity to go for a local classic from up north, where I’m from. I read recently about someone who paired Syrah with a Lancashire HotPot. And from the review he gave it, I thought it’d be rude not to. 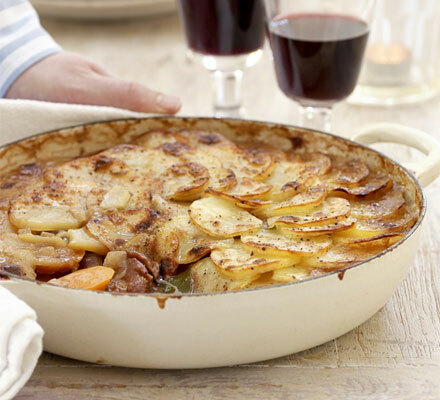 Lancashire HotPot is basically just a thick lamb stew covered with potatoes to keep it moist in the oven. The nice thing is, as with any stew, you can use the basic idea of what it is, but play around with the ingredients. Ok, so it won’t be 100% a Lancashire Hotpot, but I haven’t got any chunks of lamb in the flat at the moment, so lamb is out, and beef is in. Also I want to swap the kidneys for nice fat chunks of streaky bacon. Northern Rhone reds are pretty famous apparently for a bacon flavor (yes that’s right folks, a wine that has a bacon smell!!!!! ), so that’s a fair substitute I thought. If you want to stick to the script, there’s a recipe from the good ol’ BBC on the link below. #NWTW Week 45: Where To Start? You nailed it. Lamb in any form is my #1 choice for pairing with Northern Rhone Syrah. was amazing, if I do say so myself! I don’t doubt it! I unfortunately can’t drink at the moment but this totally gave me food & wine envy! You can always spit it out?! ← #NWTW Week 45: Where To Start?